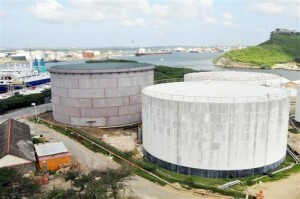 WILLEMSTAD - As of May 2nd, next week Tuesday, new fuel tariffs will be introduced. Gasoline will be 3 cents cheaper per liter at the gas station. Now gasoline costs 1.65 guilders and it will be 1.62 guilders per liter. Diesel also drops in price: 5 cents, from 1.13 to 1.08 guilders per liter. Propane gas price will remain the same: 40 guilders for a big cylinder, 8 guilders for a small one. Next Monday, May 1, the new rates for Aqualectra will begin. Electricity goes down in the base rate by more than 3 cents per kilowatt hour. Now it's over 50 cents, and will be about 47 cents. Water becomes a fraction more expensive at the base rate, almost 1 cent. Now 7.02 guilders are paid for each cubic meter and it will be 7.03 guilders.